4. Beat egg whites on low until foamy; continue on high until stiff peaks form (You should be able to turn the bowl on its side without the whites moving. 5. Add sugar to egg whites a little at a time while continuing to beat on high. 6. Add spices and cocoa all at once and fold in by hand (Fold in fully but don’t worry about streaks of cocoa). 7. Pipe or drop (by small spoonfuls) the mixture onto the baking sheets and bake for 60-90 minutes. I’m famous for my inability to exactly follow directions, er…, recipes as well as for my ability to combine four similar recipes into one. This recipe is no different. This stems from a need to cook with ingredients I have on hand because there’s no way I’m making a trip to the store for just a few ingredients. I developed this recipe using the Chocolaty Meringue Stars recipe from “Betty Crocker’s New Choices Cookbook” and Debby Lovell’s Chai Meringues recipe from “Chai: The Spice of India” and, of course, the creative process unique to…me. I honestly can’t remember how much cocoa I used because I didn’t write it down (OK. I do this a lot too.) but I’m pretty sure it was a tablespoon. But…you can never have too much chocolate, right? I’m also pretty sure I added a teaspoon of vanilla (Do this at the beginning of the beating process. (No doubt I had good intentions of following a single, only-slightly-altered recipe for once when I started out.)). Why don’t I know exact measurements? Because I add a little until it smells right. Tip: use your sense of smell when cooking. It often tells you how much and what to add. The smell is overwhelmingly divine. Absolutely unbelievable. Try not to eat all of the mixture before you bake it. Yeah, really, it’s going to be hard not to eat raw egg. I used a plastic sandwich bag with the corner clipped off to squeeze the meringue onto the baking sheets. You can bake them for as little as 30 minutes but they will be chewy inside. I baked them for 60 minutes and let them set in the oven for another hour before my perfectly crispy, perfectly spiced meringues were whisked away to a birthday celebration. Want to make these even more delicious? 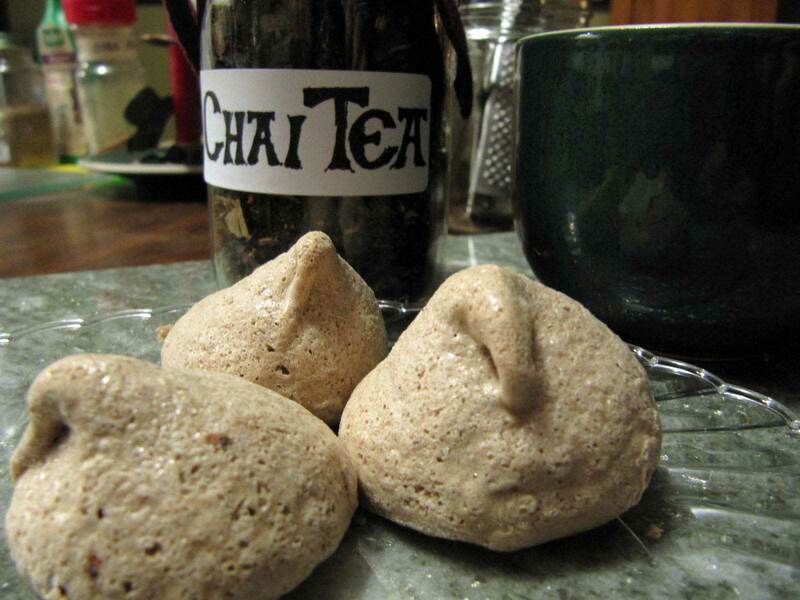 Eat them with my Chai Tea. This entry was posted in Food, Recipes and tagged dessert, Food, ground cardamom, meringues recipe, Recipes. Bookmark the permalink. Those look like what Peeps WISH they could be! Thanks! Hmmmm, making them look more Peep-ish. That’s an excellent idea.